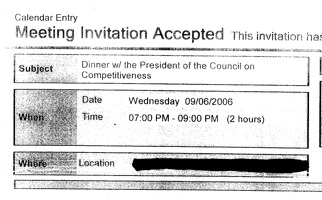 Documents obtained by EPIC from the Department of Commerce under the Freedom of Information Act reveal that the Chief Privacy Officer had more than 25 meetings with business lobbyists across the country during a two-month period in 2006 even though he was unable to attend 1 pre-scheduled meeting with privacy advocates in Washington, DC. Whether government privacy officials are interested in privacy. The Chief Privacy Officer of the Commerce Department agreed to speak with the Privacy Coalition, a network of privacy experts and advocates in Washington DC, but cancelled the meeting so that he could "get lunch." EPIC then filed a Freedom of Information Act request for all documents regarding the Privacy Officer's meetings with business lobbyists since his appointment in July 2006. In September the agency disclosed the loss of over 1,100 laptops-many of them contained personal information of Americans. The documents obtained by EPIC suggest that some federal privacy officials treat business meetings as a priority but show little interest in privacy. Congress is expected to hold hearings next year on federal agencies and the role of the Chief Privacy Officer.